First launched in 1957, the R-7 was the biggest leap in the world's rocketry since the German A-4. Ironically, developed to be the first Soviet Intercontinental Ballistic Missile, ICBM, the R-7 had become obsolete as a weapon even before it started flying. Yet, as a launch-vehicle, it has continued serving the Russian space program for more than half a century after it was originally conceived. 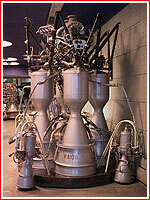 In the 21st century, the R-7-derived space boosters remain only vehicles delivering Russian manned spacecraft into orbit. The assemby of the International Space Station also depended on the R-7-based rocket, launching supply ships and lifeboats for the outpost's crews. 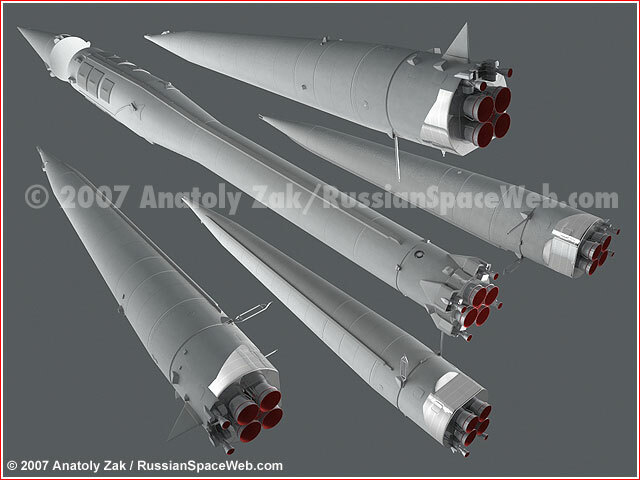 The R-7 family of intercontinental ballistic missiles with industrial designation 8K71. Sergey Kryukov, a key engineer behind the R-7. 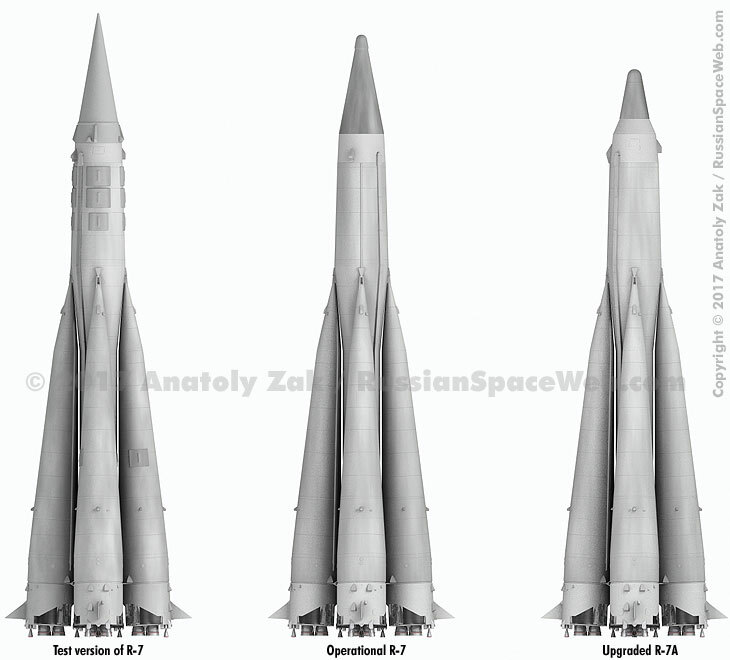 General configuration of the R-7 ICBM. Main components of the R-7 rocket. 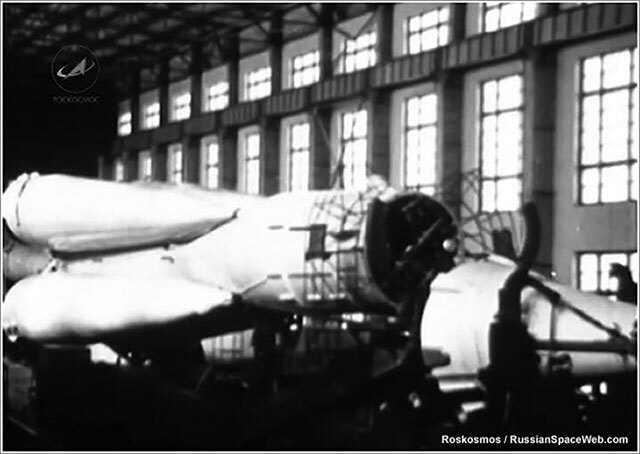 The first R-7 missile (Number 5L) arrived at Tyuratam on March 3, 1957. 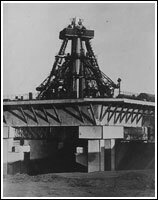 After pre-launch processing at Site 2, it was rolled out to the launch pad at Site 1 in the yearly hours of May 5, 1957. Key officials in charge of the program, walked by the transporter/erector all the way to the launch pad, starting a long tradition of future Soviet space launches. 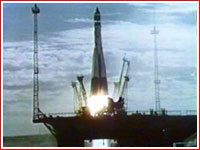 1957 May 15, 19:01 Moscow Time: The first R-7 lifted off from Baikonur. It was programmed to fly a standard test distance of 6,314.5 kilometers, however failed and crashed 3,197 kilometers downrange, deviating 12.6 kilometers from the nominal flight path. 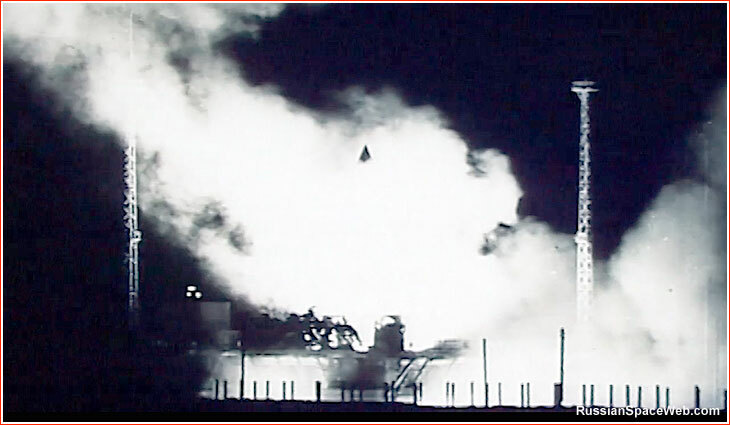 Western sources suggested that the vehicle failed after around 20 seconds, however post-Cold War Russian memoirs revealed that although the fire in the tail section of the rocket developed shortly after the launch, controlled flight went on until T+98 seconds and the emergency shutdown of the engines took place around 100 seconds after liftoff. An R-7 missile being integrated with the original version of its warhead. During June 10-11, 1957, there were three attempts to launch the R-7 rocket (Number M1-6). However the missile remained grounded due to technical problems. It was ultimately removed from the pad and eventually used as a training vehicle. 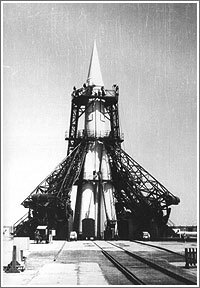 1957 July 12, 15:53: The R-7 rocket (Number M1-7) lifted off from Baikonur. The vehicle disintegrated at 32.9 seconds in flight. Its debris crashed about seven kilometers downrange (four kilometers, according to other sources). 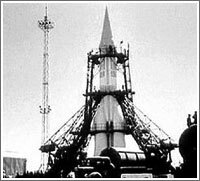 1957 Aug. 21, 15:25: The R-7 rocket (Number M1-9) launch from Baikonur. Flight went normally, but the warhead disintegrated at the altitude of around 10 kilometers over Kamchatka Peninsula. Despite a mishap at the end of the mission, on August 27, 1957, TASS officially announced "...the creation of a long-range multistage ballistic missile in the Soviet Union." The announcement went largely unnoticed in the West. 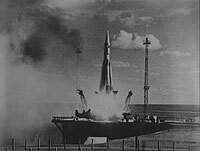 1957 Oct. 4, 22:28:34 Moscow time (00:28:34 local time on October 5): The R-7 rocket (Number 8K71PS) launched world's first artificial satellite PS-1 or Sputnik-1 from Baikonur. 1957 Nov. 3, 05:30:42 Moscow time: The R-7 rocket launched Sputnik-2 carrying dog Laika onboard from Baikonur. Laika died three days after the launch from overheating of her cabin. The spacecraft had no reentry system onboard. 1957 Dec. 22: The R-7 rocket (8K71 Number 11) arrived at Baikonur. Its first launch attempt took place on Dec. 31, 1957, but it was scrubbed. 1958 Jan. 30, 00:15: Test launch of the R-7 rocket (8K71 Number 11) with the M1-12 warhead. 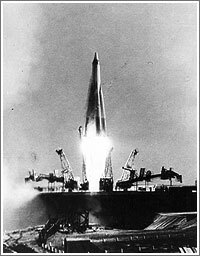 1958 March 12, 22:30: The attempt to launch the R-7 rocket (8K71 Number 6), which was removed from the pad in June 1957, failed again shortly after ignition of the first stage engines. The launch was aborted safely and the rocket was shipped back to the manufacturer. 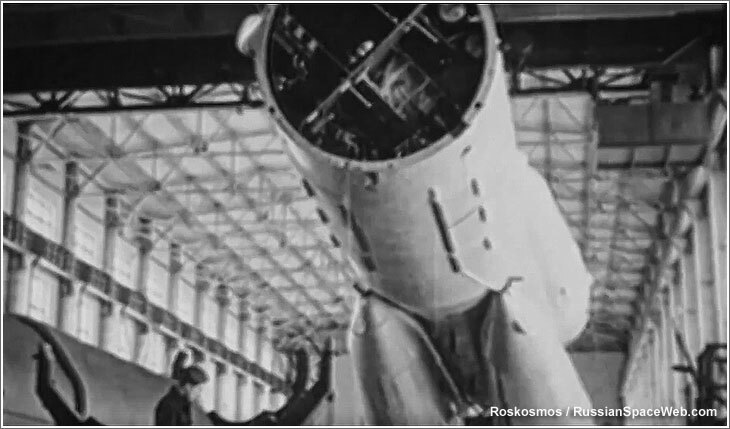 1958 April 4, 18:30: Launch of the 8K71 (No. 12) with the B1-11 warhead. Slight overflight of the target with some flight control problems. 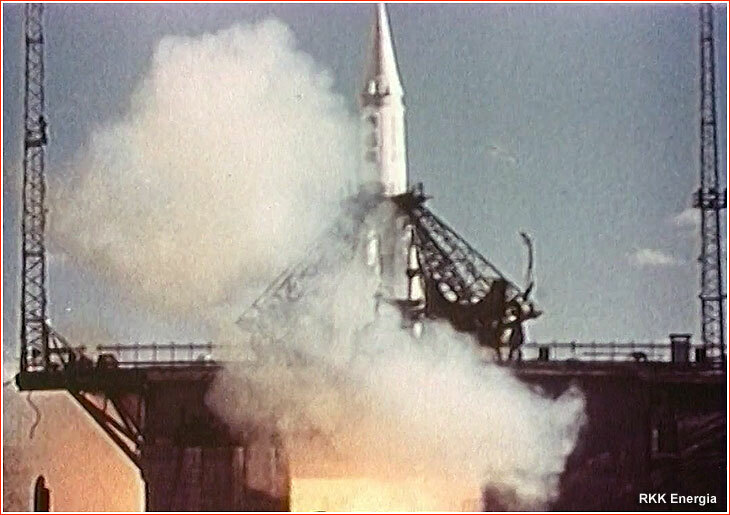 1958 April 27, 12:01: Launch of the 8A91 B1-2 launch vehicle, carrying the Object D satellite. The rocket disintegrated 96.5 seconds after the launch. Test launches of the R-7 ICBM and its upgraded version known as R-7A continued in Baikonur during 1958 and 1959. According to one source, the test flights during the second half of 1958 and the entire 1959 apparently carried payloads code-named Sliva (plum) and Grusha (pear). 1958 Sept. 23: An R-7-based 8K72 No. B1-3 launch vehicle fails 93 seconds after liftoff during an attempt to send the E1 No. 1 probe to impact the Moon. 1958 Oct. 12: An R-7-based 8K72 No. B1-4 launch vehicle fails 104 seconds after liftoff during an attempt to send the E1 No. 1 probe to impact the Moon. 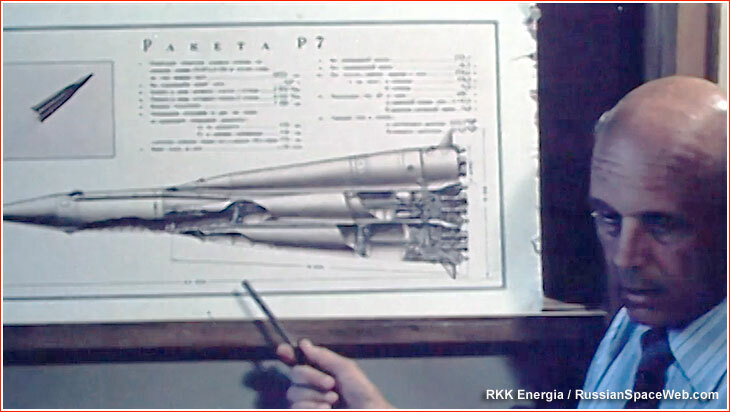 1958 Dec. 4: An R-7-based 8K72 No. B1-5 launch vehicle fails 245.4 seconds in flight during an attempt to send the E1 No. 1 probe to impact the Moon. 1960 Jan. 20: The R-7 ICBM enters armaments of the Soviet Strategic Missile Forces, RVSN. The original version of the R-7 ICBM rolls out to the launch pad. 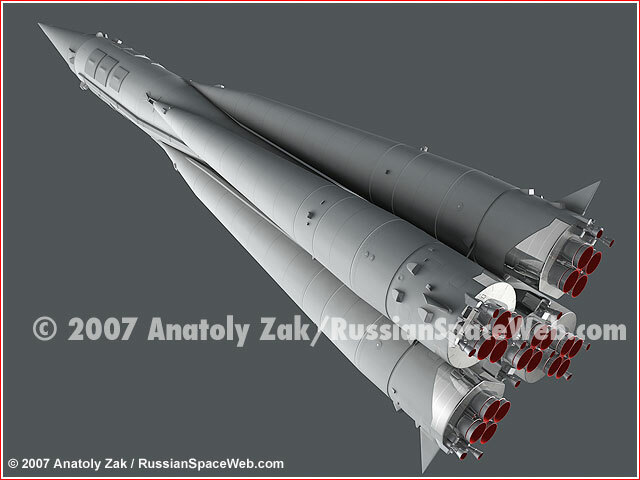 Note that the rocket is primarily white, despite popular Western tradition of depicting it in olive green colors. 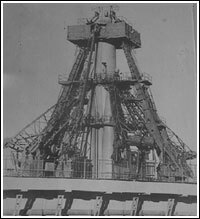 An R-7 ballistic missile on the launch pad at Site 31 in Baikonur circa 1960. An R-7-based rocket launches a E1 probe toward the Moon.